Lyric Opera of Chicago's Rigoletto, 2017 a triumph! Last night I was reminded of what happens when opera is done right – very right. 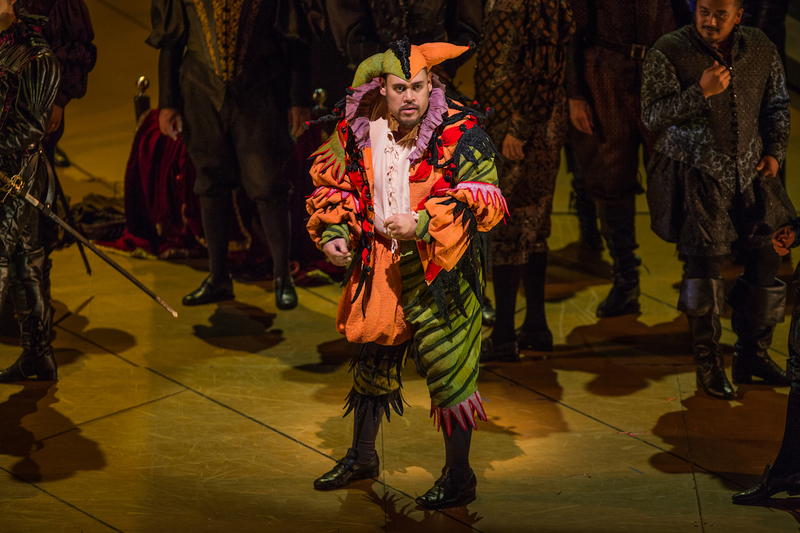 The opening performance of Lyric Opera of Chicago’s Rigoletto was a masterfully executed, well-rounded tour de force. First and foremost, the vocal performances in Lyric Opera of Chicago’s Rigoletto were world-class. Leading the cast were Evanston native Matthew Polenzani as the Duke of Mantua and Hawaiian baritone Quinn Kelsey as the title character, both of whom have become staples in the roster at Lyric (lucky Chicagoans!). The leading men could not have been more comfortable in their respective roles; these were clearly singers who have delved into, explored, and mastered every nuance of their parts. Polenzani dazzled the audience with all three of his spectacular arias, one in each act: “Questa o quella” (Act I), “Parmi veder le lagrime” (Act II), and the most well-known tune of the entire production, “La donna é mobile” (Act III). Act II’s scena ed aria “Povero Rigoletto – La rà, la rà – Cortigiani, vil razza dannata” left me emotionally spent as I watched Kelsey move through his desperation, first attempting to inconspicuously glean information about his daughter’s whereabouts, then losing himself as he angrily chastises the courtiers, and finally resorting to begging them for compassionate understanding in a last-ditch effort to save his daughter from the clutches of the lascivious Duke. The extended applause following this scene could not have been more deserved. 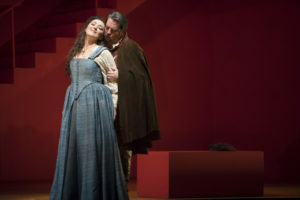 Speaking of lengthy applause, the award for longest applause during Lyric Opera of Chicago’s Rigoletto easily went to Italian soprano Rosa Feola, last night’s Gilda, whose Act I aria “Caro nome” stole the show. Growing up listening to the 1971 Decca recording of Rigoletto with Joan Sutherland as Gilda, I had high expectations, but Feola easily surpassed them. It wasn’t only “Caro nome,” however; her duet with Polenzani – “È il sol dell’anima” – was truly a thing of beauty. Perfectly complementing one another, the couple merged into one as their last notes melted into a passionate kiss. Feola is one of those performers who has it all: a strong stage presence, a tone of sheer beauty, the ability to make anything seem natural, and the power to make the audience beg for more. This young Italian soprano made her Lyric debut last night, and I feel fortunate to have witnessed it. She is certainly someone to watch! Chicago operagoers were also fortunate to hear excellent performances in the opera’s supporting roles, including Ukrainian bass Alexander Tsymbalyuk as Sparafucile, Latvian mezzo Zanda Švēde as Maddalena, Ryan Opera Center baritone Takaoki Onishi as Marullo, and American baritone Todd Thomas as Count Monterone. Marco Armiliato led a fantastic orchestra whose strings were full of Verdian passion. During forte sections in the “Preludio,” I feared that the powerful sounds from the large orchestra may cover up the singers, but my fears proved unfounded: Armiliato’s ability to balance his orchestra and singers was nothing short of perfection. It was simply and unequivocally a triumphant opening of a spectacular production. Michael Yeargan’s minimalist set beautifully conveyed 16th century Mantua, focusing Lyric Opera of Chicago’s Rigoletto on its greatest asset: the vocal performances of its leading characters. 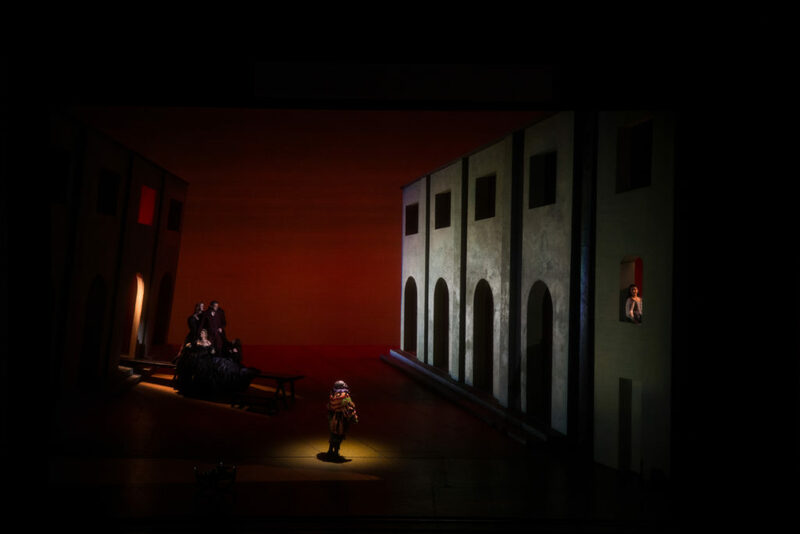 One interesting set choice was the decision to use half of Rigoletto’s home from Act I as Sparafucile’s inn in Act III: the home that was once Gilda’s prison became the location of her death. Was Rigoletto’s overbearing nature, represented by his home in Act I, to blame for his daughter’s death, represented by the same home as the inn in Act III? Yeargan’s set does what all sets should do: it adds to the production as a whole, making it more than the sum of its parts. Like all live performances, last night’s opening wasn’t perfect; there were some entrance and tempo issues in chorus numbers, and the Act II to Act III transition was unusually long, causing the audience to wonder if everything was moving along as intended. These trivial hiccups did nothing to detract from the quality of the production as a whole, however. It was simply and unequivocally a triumphant opening of a spectacular production.